Announcements throughout the race event will help increase breast cancer awareness and the available support for males and females affected by breast cancer. The United Breast Cancer Foundation is thankful for the opportunity to raise awareness about male and female breast cancer. During the three day event UBCF representatives will interview spectators, pass out information, and let attendees know that UBCF’s life-supporting programs are available to women, men and families across the country. In addition to reaching hundreds of thousands of attendees, those at home will also view the UBCF messages during the race when the jumbo-tron announcements are on-screen. According to the National Cancer Institute an estimated 2,350 men will be diagnosed with breast cancer this year, and 440 will lose their battle with the disease. One reason for such a high mortality rate is that men are not encouraged by health professionals to self examine or be screened for breast cancer. UBCF encourages men to learn the self-breast exam and to be routinely screened by a doctor. 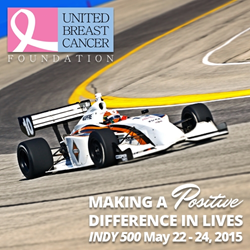 Participation in the race event will help increase awareness of the UBCF vehicle donation program. Those interested in donating a car, truck, van, SUV, or other types of vehicles can call 888-433-6207, or visit our car donation website http://www.driveoutbreastcancer.org. Those interested in making cash or other types of doantions can visit our secure donation website at http://www.ubcf.info. Checks can be mailed to: UBCF, 205 Depot Road, Huntington Station, NY 11746. Or, include UBCF in your Combined Federal Campaign support - #77934. Call toll-free, 1-888-433-6207 to set-up your donation today. Stephanie closed her remarks by saying: “The mission of UBCF is carried out every day through life-supporting patient and family programs available to women, men and families across the country. UBCF never denies services to anyone regardless of age, race, gender, ethnicity, income or medical insurance coverage.” If you, or someone you know, is in need of a breast screening or other breast health services, visit UBCF at http://www.ubcf.info or call toll-free, 877-822-4287. Founded in 2000, the United Breast Cancer Foundation (UBCF) is a national nonprofit organization whose mission is to make a positive difference in the lives of those affected by breast cancer. UBCF offers the community seven patient and family programs dedicated to breast cancer screening and prevention, treatment and patient health and well-being. UBCF educates the public on a variety of breast cancer issues, including: coping with breast cancer, family support, environmental awareness, dietary options, complimentary therapies, research, and prevention. http://www.ubcf.info 877-822-4287.